FREE – 3pm to 6pm each day. 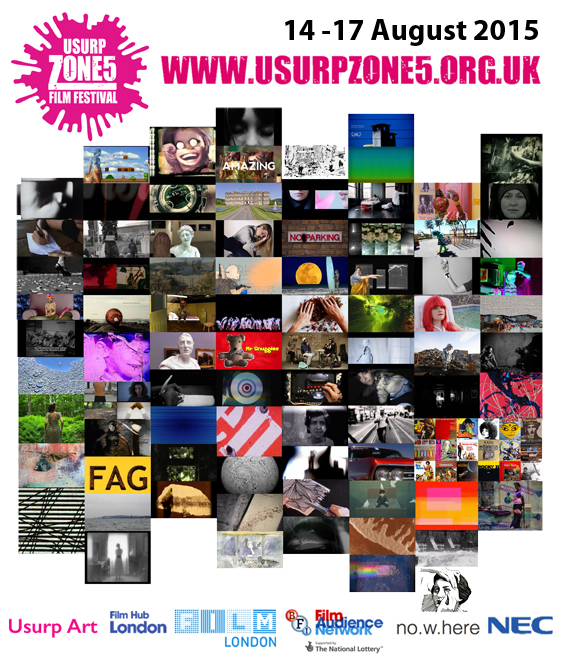 41 artists and filmmakers are exhibiting at the Usurp Art Gallery as part of the Usurp Zone5 Film Festival. In darkness, the aura flickers and an immersive sonic environment is created for a visual and aural extra sensory experience. Exploring avant-garde filmmaking, hand crafted cinema techniques and a cacophonous post-internet art style, this ambitious exhibition presents some of the best of international current image making. Films that explore the perception of family memory, such as artist and lecturer, Sally Waterman’s ‘Against’ with a score by Donna Mckevitt based on Derek Jarman’s writing, to Melanie Menard’s ‘Ghost House’, shot in abandoned houses in Ireland. Films that celebrate sound and perception, such as Japanese artist, Eisuke Yanagisawa’s ‘Ferry Passing’, with it’s unprocessed field recordings using an Aeolian Harp made by the filmmaker and installed on an uninhabited island, to Canadian filmmakers, such as, James Pomeroy’s ‘Framestorm’, an experiment in colour, rhythm and movement inspired by the Free Jazz compositions of Ornette Coleman. Films that are handcrafted, such as the film ‘The Rapture’ by British artist Michael Fleming, a frame by frame hand manipulated 35mm celluloid collage film, to Spanish filmmaker, Hernán Talavera’s ‘You won’t come back’ a haunting, poetry film based on a poem by Alfonsina Storni, from his book ‘Poems of Love’ written in 1926. Films that play with appropriation and plunderphonics, such as ‘Tape Loading Error’ by Sandra Araújo, based in Portugal, that uses the imagery of Magritte’s surrealist paintings and subverts the visual culture of video games, and Canadian filmmaker, Clint Enns’s ‘Let Me ASMR You’ that explores the curious sensual world of ASMR (Autonomous Sensory Meridian Response), inducing sounds from videos that proliferate on You Tube.